Silver Arrow Knits! : Better Late than Never! I've been bad, I know. I can't even give a good excuse for the lack of posting. I finished with midterms and I have been spending my time watching The X-Files. Why haven't I been knitting while watching The X-Files, you ask? Well, I have been going through the piles of papers around my apartment. I have piles of class notes, random fliers from plays I have seen, and important papers (like my electoral ID). It doesn't promote easy access I will tell you. 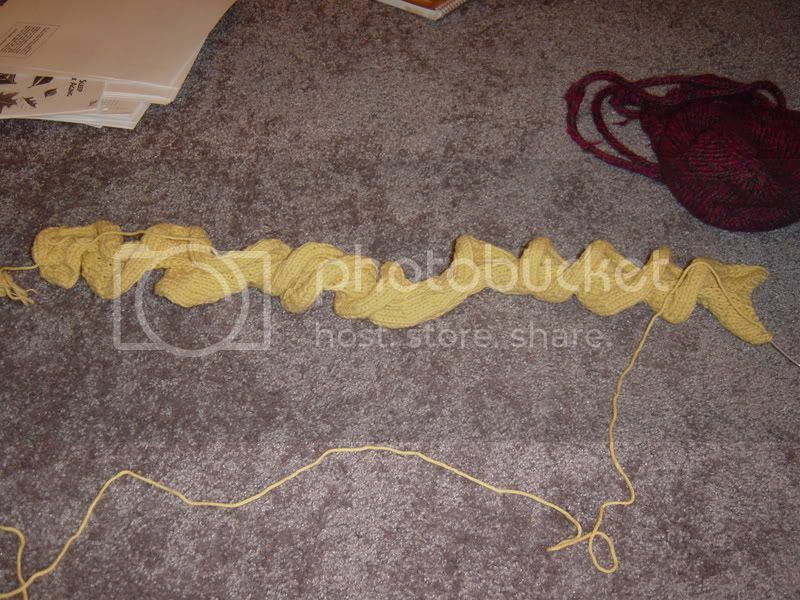 To earn your love again, I give you pictures of the ongoing happy yellow scarf. I now remember why I got tired of knitting scarves and started on hats. Scarves start fast and then they drag on f-o-r-e-v-e-r. OMG, I can't seem to finish the first ball. How I despise the very nature of the scarf. Oh, here is the fabulous yarn I got at Walmart a few weeks ago. 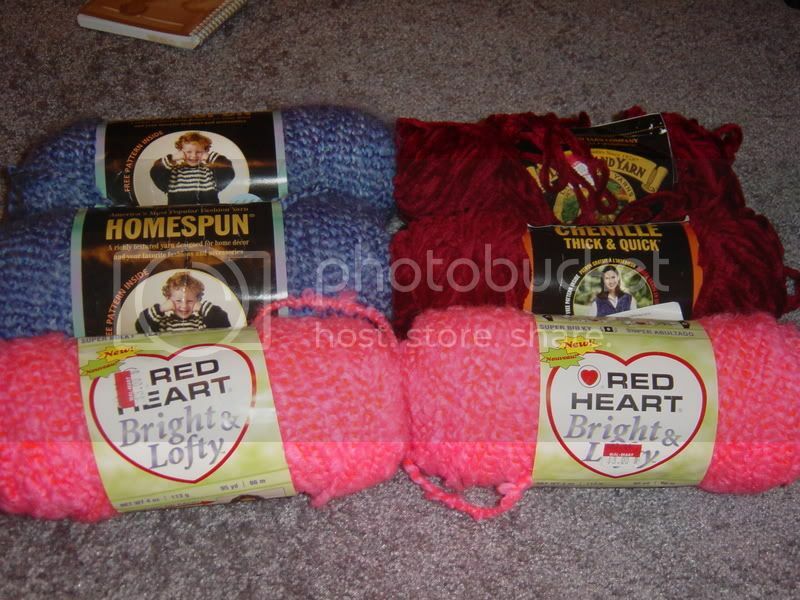 The Homespun was only $2 each, the Chenille was $2 each too, and the neon hot pink yarn was $3 each. The only sad part about the yarn is that I am going to make scarves out it. As you read above, I don't like knitting scarves. Will wonders never cease! Enjoy and have a lovely Tuesday night and Wednesday day (and night)! Scarves are too too long, agreed. I don't know why everyone thinks they make great beginner projects. How boring. It's a good thing you live in Florida! And I love the commericial with Ellen. Are you all settled in now? Don't get lost, know the neighbors by sight, stuff like that? I know how you feel! I have made a zillion scarves since learning to knit last year - yet I never actually WEAR scarves! And no one I know really wants one (well, they don't want MINE anyway!) - but but but - they seem so easy when you first start! Maybe I should go back to washrags - at least I get some use out of them!